What is Pool Colour Guard? The Saint-Remy is the latest pool and spa combination from Aqua Technics Pools that gives you both swimming and relaxation zones all in one. Holiday at home with your own indulgent pool and spa experience. You can choose your project to stop at the swimming pool installation or be completed fully with landscaping. Saving time and benefiting from quality & warranted work. Aqua Technics Fibreglass Pools are manufactured to strict quality standards. Built using modern corrosion resistant materials with exclusive patented technology, which is unsurpassed when compared against other manufactured fibreglass pools. Ask one of our professional consultants about the easy staged payment schedule, or if you're just planning we can provide you with fibreglass pool prices. Do you want an idea on where your swimming pool can go before your professional consultation? Visit and login for free on the Sydney Water Tap-In Portal. Saltwater swimming pools are easy to maintain and gentle on your eyes. The salt is converted to chlorine to sanitise your pool without the strong chlorine odour of your local public swimming pool. We recommend the Magnapool® system with magnesium. It has been found to have benefits in helping to relax your mind and body. It can help in detoxifying the body, reducing aches and pains, relieving stress and anxiety and providing the muscles with energy. Hydroxypure is your choice for a chlorine free system for children with chlorine sensitivities. All of your pool water options are available with a selection of automated features that can help you save on water, energy, time, chemicals and costs. The air venturi jet's are great for a simple champagne effect on the water producing bubbles or a relaxing massage. We customise and build your water feature to your individual design. Robotic pool cleaners for automated cleaning of walls and floors. Gas, Electric and Solar Heating options available and matched to your needs. Made of steel and sound proofed, the enclosure will keep your equipment safe from weather and meeting council regulations. Saving up to 45% off your heating costs, there are a variety of pool covers for your pool. Meeting Australian Standards the skimmer lid is upgraded to replace the plastic version which is prone to fade and crack. An extra line with two suctions and a return line is installed on your pool for your solar heating. Our on-site evaluation to prepare your project requirements, costs and design. We use the popular SPASA industry body contract. Home warranty insurance and other related council approval documents will be prepared whilst our draftsman finalises your plans for private submission. 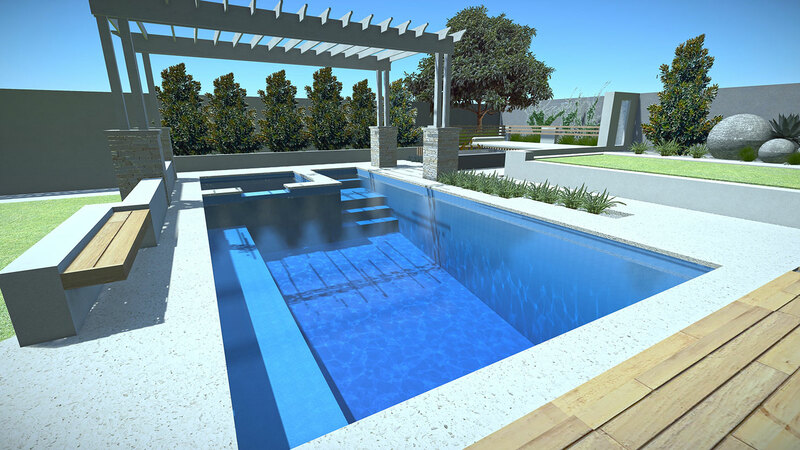 Sourcing Australia’s best made fibreglass pool was a challenging task. Anyway, we found it and we manage and deliver your pool ourselves on time every time. An often difficult part of the process is made easy with our team also doing the excavation and preparation for your swimming pool installation. 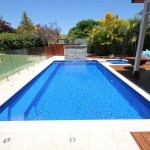 Our team is very proud to install your pool exactly where it is suppose to be and installed to Australian Standards. Your project can be managed completely internally, saving you time and minimising costly headaches! We then step you through on how to use your equipment and have your pool up and running in no time. A most important step in finalising your project, once your pool area is full secured meeting fencing and safety regulations your swimming pool will be inspected and approved.